Uploading or downloading files from a REST web service is a common feature. The Open API Specification specifies uploading and downloading of files over a REST API. TSOA can generate OpenApi compatible REST services but file handling is a week spot. There are open pull requests for file upload and download but in the meantime you have to find a solution by yourself. Maybe the following solution will help. In short words we put a file in a HTTP request and read it back in the API from the request by hand. To make things easier we use the middleware multer to handle the file streaming from client to server. Since TSOA generates the service routes but do not know file handling at the moment we have to overwrite the generated route with some data annotations. Lets look at the example. TSOA provides great flexibility by defining REST service APIs. Unfortunately if your service consumes or produces files there is no easy way to setup service functions yet. This article tries to provide an example that shows how files can be uploaded or downloaded from a REST service with TSOA, Aurelia and multer. There is only this one upload function in this controller. You can put other functions beside it without causing damage. For our example we wanted to keep it clean and readable. We can give TSOA custom parameters in the tsoa.json configuration that will be used to generate the route of this URL. So we add the request parameters for multipart file transfer. TSOA will use this definition to generate a compliant OpenAPI description (swagger.json). This configuration expects that the uploaded file is stored in the field imageFile so that our controller can read the file from this field. That’s it! You can recompile and start your service and it will offer a function where you can upload a single file. 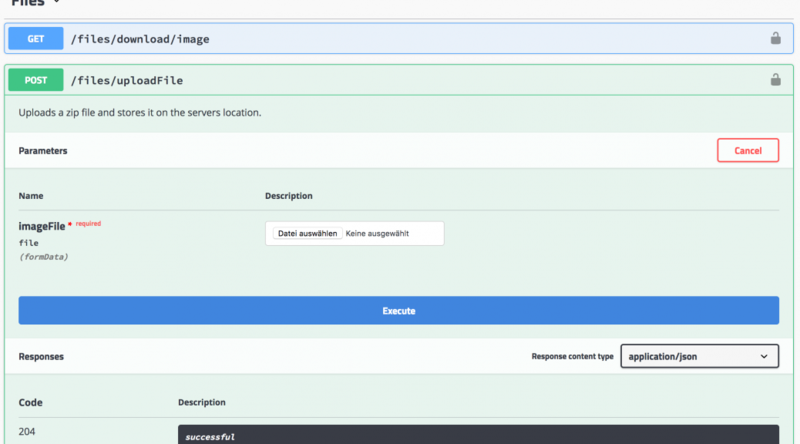 To upload a file to the running service function we could use the Swagger UI. We can trigger an upload over a custom GUI. We can use Aurelia for a very simple GUI running in a web browser. // DO NOT provide ANY Content-Type Header!!! Let the browser take care of setting the content-type! Our small example GUI opens a file chooser dialog that lets the user select a zip file from his computer. The upload will start when he presses the upload button in the GUI. To upload the file a client (client.FileApi) is used. You can generate a suitable client with Swagger Codegen. But you have to overwrite the generated function for our uploadImageFile function with the example code. The custom code puts the zip file in a form data and in the field imageFile that our service function will use for reading the files content. This solution works similar to the upload example but we have to have to hack our way through the TSOA code. On the server side we need a physical file that is feed to multer and on the client side read it back into the browsers memory. We have to use another hack to let the browser think he is downloading the file he already stored in his memory. So this solution get a little bit dirty but show how it could work. We add a custom route description for the new download function. We describe that the new URL http://localhost/files/download/image will produce a zip file. We are not done yet. To let TSOA generate routes that handle file downloads we have to rewrite some TSOA code. TSOA does not know the file type yet. To let TSOA handle files when generating files we have to copy the existing code and add our own route handling for files. It should be ok since we use the altered code for file download functions only anyway. For this matter the classes FileResult are created. If TSOA finds a file result it adds file handling into the the generated routes code. This example adds a download function to a REST API of a web service. You can call the new download function over the Swagger UI. Alternatively you can include the download into a web client running in a browser. Again we can use Aurelia for a very simple GUI client. Again the used client can be generated with Swagger Codegen but the generated implementation should be replaced with the given example code. The code handles the services response by returning it the complete response to the calling function. When the user clicks the download button in the GUI the client calls the downloadImageFile at the web service and waits for the response. If the client gets the response it first reads the file name of the returned file. Next it applies a hack to let the browser handle the file as download. The client loads the file puts it into a link and clicks the created link all within code and memory. This causes the browser to handle the file as a typical download file and ask the user if to open or where to store the file. It’s a little trick to avoid writing different code for different browsers.